We provide learning opportunities for young people age 3 through 12th grade. We invite you to join us. Click here to register or contact the church office to request a form. Anyone who is interested in teaching may contact the church office. Grace Time: 3-year-olds are encouraged to take part in a time set aside in the church nursery for a faith story, snack, and simple craft each Sunday, from 10:00-10:30. Our staffed nursery is also available for all children throughout Sunday morning, from 8:40-12:15. Godly Play: 4 and 5 year-olds (pre-K) get to take part in Godly Play. This unique educational approach helps young children to explore their faith through story, to gain religious language, and to enhance their spiritual experience through wonder and play. Meets Sundays, 9:55-10:45 a.m.
Trinity Village: Students grades K through 5 meet Sunday mornings. Students take multiple approaches in engaging Bible passages during the course of the year. Story, art, service, team-building exercises, and worship will all play significant roles. Meets Sundays, 9:55-10:45 a.m. 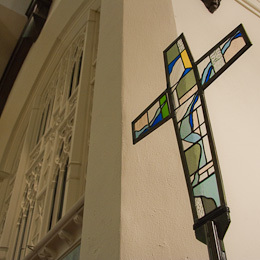 Confirmation: The confirmation program at Holy Trinity is for youth in grades 6-9 and offers students and their families help in grappling with life issues in light of our Christian faith. It includes worship participation and leadership, classes, retreats, summer camps, service, and community-building activities. High School: There are regular activities throughout the year and summer for high school students, including service projects, discussions, retreats, summer trips, and community-building.